Here’s some good news, if you can call it that. Real estate experts at a recent housing forum in San Francisco determined that we are in the midst of an “affordability crisis,” not a housing bubble. Jed Kolko of Trulia fame and Tim Cornwell of the Concord Group told attendees at the SPUR Urban Center in SF that it’s more an issue of supply and demand, not necessarily an overheated housing market. In SF, which ranks #1 in terms of unaffordability for the 100 largest metros in the United States, only 14% of for-sale homes are affordable to the middle class. That compares to 34% in San Jose and 40% in Oakland, both of which are also in the top 10 in terms of unaffordability. But that doesn’t make it a bubble, at least not yet, despite Karl Case of S&P/Case-Shiller declaring one in certain cities a year ago. Kolko took time to explain the subtle differences between a bubble and an affordability crisis, as seen in the chart above. As you can see, high prices relative to incomes are an affordability issue, whereas high prices relative to the “fundamentals” spell bigger problems. Affordability is also more of a supply/demand issue, while bubbles are more irrational price divergences. Additionally, high prices AND rents point to an affordability issue, while high home prices relative to rents are more of your classic bubble territory. Finally, affordability can persist well into the future, and as we all know, bubbles eventually pop, sometimes pretty abruptly. Why It’s Not a Bubble? The argument continues to be the same, that less household income is going toward the mortgage, but that’s really only because mortgage rates are artificially low. If rates were more, dare I say, normal, there’s a chance mortgage payments wouldn’t be so attractive (or at least manageable) relative to rents. In fact, RealtyTrac said today that if interest rates rise a full percentage point from current levels, 630 counties (representing 46% of the total population) will exceed their historical averages for income-to-home price affordability. And 59 counties will exceed their historical peaks (bubble territory) for income-to-home price affordability. Another reason home prices supposedly aren’t in a bubble, and are only “modestly” overvalued is their current level relative to the previous bubble. 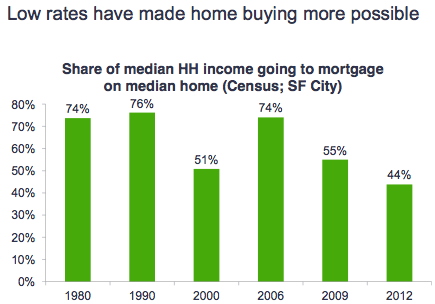 At the moment, San Francisco metro area home prices are just six percent overvalued when looking at the historical relationship between median incomes and home prices. That compares to 53% overvalued during the height of the previous boom. In other words, when you compare current prices to levels seen in 2006-2007, things still look great. But using that insane time period as a measuring stick (coupled with low interest rates) might not be the best way to determine whether home prices are dangerously elevated or not. In order to improve housing affordability, Kolko offered two “options,” increase supply or reduce demand. One solution is simply to build more homes, which will obviously increase supply. But he noted that both geography and regulations constrain supply in the Bay Area, so making it easier to build new housing units could aid affordability. Apparently the Bay Area has suffered from decades of underbuilding, per Cornwell, and demand has just kept rising in the tech-rich area. If there’s a larger housing supply, demand relative to supply will be weaker, which should push home prices lower, or at least keep them from rising at an unsustainable rate. Lastly, consider the fact that even though we may not be in a full-blown national bubble, mini bubbles are popping up all over the country. So look local instead of national if you want a more accurate picture of your housing market.